More than forty years of age. 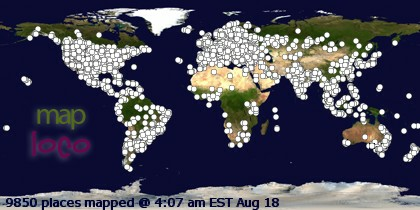 A couple thousand books read. Hundreds of science fiction novels in my library. And yet, I still had not read Douglas Adam’s Hitchhiker’s Guide to the Galaxy (1979). That is, until now. Arthur Dent awakes one day to find bulldozers outside his front door, waiting to plow his house under to make room for a new freeway. A man named Ford Prefect approaching, he convinces Dent to go out for some fresh air as the world is going to end in five minutes anyway, and that it would be best to spend those five minutes with Prefect as he has an escape route. The prophecy coming true, Dent finds himself aboard a space ship as the Earth disappears in a cloud of dust—the alien Vogons having cleared the planet to make room for a new intergalactic highway. Picaresque the only word to describe it, Dent’s subsequent adventures zipping across the galaxy involve a morose robot, Prefect’s two-headed (and wonderfully named) cousin Zaphod Beeblebrox, and the only other person to survive Earth’s destruction, Tricia McMillan. Let the fun begin! As one can inherently feel while reading, The Hitchhiker’s Guide to the Galaxy is based on a stage production. 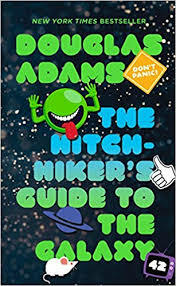 A tongue-in-cheek, dialogue-based adventure moving from scene to scene, Hitchhiker’s Guide is at times laugh-out-loud funny and always unpredictable. Despite all the years of not having read the book, I now see the appeal (as well as one of Terry Pratchett’s main inspirations). Adams’ sense of humor—from similes to one-liners—is wholly British, and wholly uproarious. Dent a true fish out of water, the opportunities are capitalized upon in wonderful ways. That being said, Hitchhiker’s Guide feels only like Act I. The book ends at a convenient pause, not a natural point in the story arc. It’s not quite mid-sentence, rather mid-flight (between cloud 37 and cloud 38 when the stewardess disappeared to get the drinks tray). The best way of putting is: this is a book that, if you enjoy the story beyond the style and humor, it will not be enough. You will need to read on to find out what happens. I don’t know how many other ‘big name’ science fiction novels still exist that I haven’t read, but I can’t help but feel Hitchhiker’s Guide was the biggest. And now I understand the fuss. A wonderfully satirical mix of joy in life and profound observation about its foibles, it’s an enjoyable novel at every level that fans of Terry Pratchett and Robert Sheckley (and vice versa for that remaining 1% besides me who hadn’t read the novel) will enjoy. Adams in full command of every word he puts on the page, it’s most lovable at the prosaic level, but we have to tune in to the next novel in the series, The Restaurant at the End of Time (and likely further sequels), to experience the complete idea.